This week, the BAST is all about Transmogrification and Void Storage. If you’ve been living under a rock, you can read all about both of them here and here, respectively. Please, take your time. to change in appearance or form, especially strangely or grotesquely; transform. Well, the definition doesn’t exactly match up what Blizzard has in mind with Transmogrification, though I’m sure some players will take it that way. The two items Blizzard is so excited to share with us link directly hand-in-hand. And something that a lot of players have been asking for for a while–extra storage. Whether it be for tabards, old gear, new gear, holiday items, trading card game items, profession-related items… we want more storage. That’s one of the reasons I take up one of my ten character slots with a bank toon with its own guild bank–I’m a packrat. 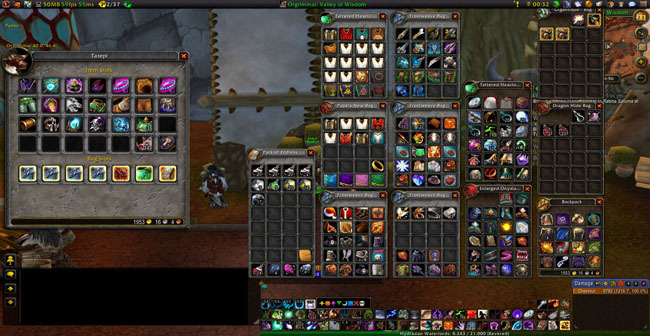 Now, while my main’s bank and personal bags are not as full as they were a few weeks ago thanks to a clean-out prior to 4.3 news (where I deleted quite a few things I now want to go back to collect again…), it’s still pretty damn full. I personally, am both excited and turned off by the ideas presented by Blizzard regarding 4.3. I am ecstatic that I will have more bank slots available (80, by my research, though I’m hoping it will be more) for more gear. I’ve always been a big gear collector and RP set creator, and hate it when I have to get rid of something that I find pretty. Or that I enjoy the references to, such as Linken’s Boomerang and the dagger, Stung. And while I’m excited to be able to wear my old gear as new gear for Transmogrification, there’s a few items I’m unhappy with. Druid sets, overall, are kind of ugly to me. Also, I’m a Bear. When on earth am I ever going to see the pretty outfit that I put together and spent all that gold on? “That cloth dress is so much prettier than my leather jerkin.” I’m sad that I won’t be able to wear some of my RP sets around on a daily basis with them being my normal gear. The eventual, “I look like everyone else” gig. The lack of being able to transmogrify Legendary weapons. If you put the effort into grinding that that out forever and ever, you damn well better be able to use it more than one tier. Don’t get me wrong, I’m fairly excited about Mogging, as the community seems to call it now (though I prefer Transmog). However, I still have reservations. We’ll see what Blizzard’s finalized details are, and make judgements from there, though. What do you guys think of transmog? Could you care less? Are you bursting with a new fever for gear? Let’s hear it! BAST: What Kind of Guild Am I? Personally, I'm having fun coming up with some "non set" looks for myself with some of the stuff I've had sitting around in my bank forever. Nature Stiched Kilt? Oh yes, it will be making a comeback.